ACCOUNTING & FINANCIAL LITERACY “Monopoly® - Reinforcing Accounting Principles” BUNDLE is a fantastic resource to use with your accounting students. This game reinforces the accounting principles in a fun and exciting way, your students will "run" to class to resume play - A GAME THAT BUILDS YOUR BUSINESS DEPARTMENT! Students love to play Monopoly® board game (not included) as they learn the fine art of accounting. Incorporate a well-known game, Monopoly®, into your accounting course that introduces "T Accounts" and accounting principles in an exciting and fun way. PLEASE IMPLEMENT THIS PRODUCT IN YOUR CLASSROOM BEFORE Y0U RATE THE QUALITY AND JUDGE THE CONTENT. OTHERWISE, IT IS UNFAIR TO THE AUTHOR WHO HAS SPENT COUNTLESS HOURS PREPARING A HIGH-QUALITY PRODUCT TO SAVE YOU TIME, WORK, AND $$$$'S! IT ALSO GIVES YOU THE OPPORTUNITY TO PROVIDE THE AUTHOR VALID AND VIABLE FEEDBACK SO THEY CAN IMPROVE AND UPDATE THE PRODUCT TO MAKE IT BETTER FOR STUDENTS. EGR ALWAYS STRIVES FOR EXCELLENCE IN EDUCATION. We thank you! Are you looking for a “Real World” accounting experience that reinforces the accounting principles for your students? The Monopoly® board game has been used by the author in his accounting classes for 15 years – one that he has developed “FROM SCRATCH” that actually “WORKS!” Then, the Cutting Edge Accounting: Get Real!!! is just what you are looking for! 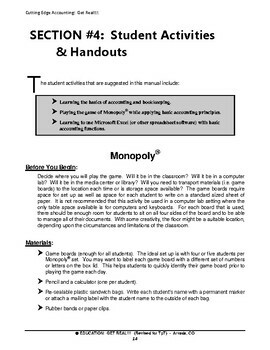 In this comprehensive unit, teams of students engage in a Monopoly® Accounting Game that reinforces student learning in a very unique way! The teams strategize the playing of the game and keep accurate records as they proceed through the activity. In this unit, the teacher facilitates student learning, incorporating a variety of instructional strategies (while addressing the National Standards) as the game is played. This unit is a "TURN KEY" ALL-INCLUSIVE (Instructional Information, Implementation Steps, National Standards Addressed, Introduction to Items to be Completed, Timeline (Day-to-Day Lesson Plans), Blackline Masters, Rubrics, Vocabulary, Tests, and Teachers Keys). This Project is based on a 16+ day timetable; however, the teacher will determine when the game is played and how often according their own class schedule. How about a "REAL BARGAIN?" Interested? 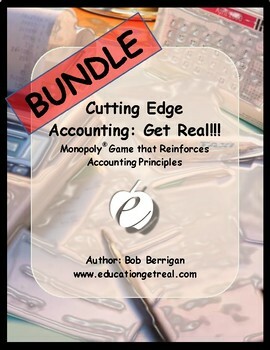 Before purchasing the digital version, you may want to consider purchasing a professionally-printed HARD COPY of this manual (called "CUTTING EDGE ACCOUNTING: GET REAL!!!) at a tremendously reduced rate. We have a very limited number of these booklets in stock - it is a GREAT reference for the teacher, has already been printed and bound, and is easy to find when needed. 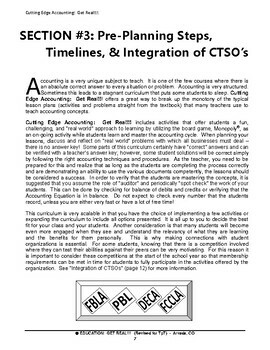 This activity is one that any accounting teacher will find useful when reinforcing the principles of accounting in their class. The price is $35.95 (shipping included). Once they are gone, we will never again have printed hard goods. To order, go to our Education Get Real website - http://www.educationgetreal.com/, CONTACT US, and fill in your information. It is that easy . . . FIRST COME ----- FIRST SERVE!!! Listed below are two components that fit very nicely with the Cutting Edge Accounting BUNDLE, both which may be of interest to you as well. Click the item to open the link in a new window. 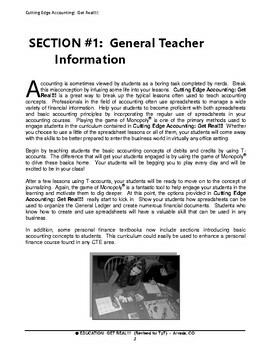 ACCOUNTING – FINANCIAL LITERACY: "Spreadsheet Activity for Accounting Students"
ACCOUNTING & FINANCIAL LITERACY – "Payroll Activity Using Spreadsheets"
Who could ask for more? Get started TODAY! Your students will enjoy this creative, exciting, fun, meaningful, challenging, and relevant accounting reinforcement activity. Incorporate these new thought-provoking instructional ideas and strategies in your teaching repertoire. All of our Education Get Real materials are available here on this Teachers Pay Teachers website. If you would like to communicate directly with us, we invite you to contact us on our website at www.educationgetreal.com and complete the form. We also produce a company newsletter so you may sign up for that on our website as well. Check us out – our EGR “Materials are Created BY Teachers FOR Teachers!" © EDUCATION: GET REAL!!! materials are copyrighted and certified by the Library of Congress. Each individual purchaser is granted permission to copy the materials for their own instructional use only. Redistributing, sharing, editing, selling, or posting this item or any part thereof on the Internet or other digital means are strictly prohibited. Violations are subject to the penalties of the Digital Millennium Copyright Act. ATTENTION PURCHASERS: Printing permitted -- for best results use a high resolution printer. Notify us through FAQS if you experience technical issues -- we aim to please! FYI: A limited number of our EGR professionally printed hard copies of this manual still remain here in our store under the category SPECIAL SALE (Manuals). If you prefer a printed version of this manual, get your copy NOW before they are no longer available. Keywords: monopoly, simulation, role of the dice, dice, spreadsheets, payroll, accounting cycle, integration, secondary, home school, math, business, accounting, financial literacy, CTE, financial, finances, game, job skill, money, technology, computers, Excel, Worksheet, trial balance, profits, losses, income statement, owner's equity, balance sheet, payroll register, accounting spreadsheets, national business standards, monopoly rubric, payroll rubric, T accounts, general journal, general ledger, cash receipts journal, payroll register, subsidiary ledger, cash payments journal, trial balance, secondary, Education Get Real, EGR. PRIOR TO COMMENTING AND RATING THIS PRODUCT, WE WOULD VERY MUCH APPRECIATE THE OPPORTUNITY TO "CHAT" WITH YOU ON Q&A BEFORE YOU MAKE YOUR PURCHASE, ESPECIALLY WHEN YOU QUESTION WHETHER OR NOT THIS PRODUCT WOULD MEET YOUR INSTRUCTIONAL NEEDS. THAT COULD BE VERY HELPFUL TO YOU AND TO US. IN ADDITION, WHEN YOU PURCHASE THE ITEM, PLEASE ALLOW AT LEAST 48 HOURS TO REVIEW IT AND/OR IMPLEMENT IT BEFORE YOU SUBMIT YOUR COMMENTS AND RATINGS. A LOW RATING IS VERY DAMAGING TO US BECAUSE ALL TPT PRODUCTS ARE EVALUATED USING A 4.0 SCALE (NOT A 5.0 or 10.0): 4.0 (100% = A); 3.0 (75% = C); 2.0 (50% = F); AND 1.0 (25% = F). THE POINTS ARE THEN AVERAGED TOGETHER AND WE RECEIVE AN OVERALL RATING. OUR AUTHORS WORK HARD AND SPEND COUNTLESS HOURS CREATING HIGH QUALITY PRODUCTS FOR OUR CUSTOMERS, AND THEREFORE DESERVE THAT CONSIDERATION. WE ALWAYS LOOK FORWARD TO RECEIVING SUGGESTIONS ON HOW A PRODUCT COULD BE IMPROVED. OUR MISSION IS TO MEET THE NEEDS OF OUR PEERS, SO PLEASE COMMUNICATE WITH US. WE THANK YOU! Education Get Real!! !